How much money will you need in Indonesia? Rp234,227 ($17) is the average daily price for traveling in Indonesia. The average price of food for one day is Rp72,545 ($5.17). The average price of a hotel for a couple is Rp241,970 ($17). Additional pricing is in the table below. These average travel prices have been collected from other travelers to help you plan your own travel budget. Indonesia is a popular island country in Southeast Asia. The country has over 18,000 islands, about one third of which are inhabited. It's also the fourth most populated country in the world, and has the largest Muslim population. The country is intersected by the Equator and sits in both the Indian and Pacific Oceans. The fastest way to travel around Indonesia is by plane. Unfortunately this is also the most expensive. Your best airline options are domestic airlines such as Garuda and Lion Air. There are also a handful of discount airlines which offer cheap flights. Ferries are another popular way to travel around Indonesia. The main ferry company is PELNI and you can often choose between slow and fast boat options. Each boat also has several classes of tickets so you can select your price and comfort level. Tourists come to Indonesia for a relaxing and beautiful island vacation which includes stunning beaches and exotic rainforests. The country's most popular destination is Bali, but there is so much more to Indonesia. The tropical forests are the second largest in the world, and unfortunately they are disappearing rapidly. The largest ethnic group in Indonesia is the Javanese and the most prevalent religion is Islam. The people are quite friendly and welcoming of both tourists and the tourist dollar. You may have to negotiate your prices down quite a bit. Despite its popularity with travelers, Indonesia remains a budget travel destination. Destinations on the beach are often slightly more expensive than inland options. Transportation is likely to be your greatest expense, particularly if you plan on traveling around a lot. If you're looking for a more comfortable, luxury hotel, there are also plenty of options available to you, and many are more reasonably priced than their western counterparts. Whatever you goal in visiting Indonesia, you are likely to be impressed and thrilled with the experience you have there. Most people take at least one flight while they're in Indonesia. Be prepared for scheduling delays as there are many. The safety records of some airlines are sub par so it is best to stick with companies such as Garuda and Air Asia, which are run within international standards. Adam Air, Lion Air and Mandala have all experienced fatal crashes in the last few years. Still, flying is more comfortable and safer than driving in most of Indonesia. If you choose to travel by ferry you will have five different classes which you can choose from. First class offers cabins with two beds each, second class has four beds per cabin, third class has six beds and fourth class is dormitory style. Both first and second classes have shared washrooms. Ekonomi class is also an option but it is recommended you bring a mat and arrive early. Also watch out for pickpockets. Scuba diving in Indonesia is excellent. Some of the best places to go for diving include Bunaken in Northern Sulawesi, Wakatobi in South East Sulawesi and Raja Ampat in Papua. There are plenty of diving opportunities in Bali, but these are generally mediocre at best. If you're an avid scuba diving you will do better to head elsewhere. Many people enjoy going to spas in Indonesia. There really are options for every budget. The most low cost options are generally housed in small huts and are simple facilities. If you're looking for the most extravagant spas then head for the five star hotels, although these are anything but cheap. ATMs are very prevalent in most touristy areas and all major cities. Do plan ahead however as many ATMs have incredibly low withdrawal limits (about US$55 per day). It's also trickier to find ATMs if you're traveling into more rural areas that aren't popular with tourists. In these cases it is best to carry money with you. Looking for a hostel in Malaysia or Indonesia? Traveling alone to Kuala Lumpur or Penang? Looking for a party in Singapore or Bali? Borobudur: This is a beautiful Buddhist Temple that dates back to the 9th century. It is a common destination for many pilgramages and its Gupta style architecture highlights the Indian influence in the area. Bali: With its beautiful beaches, thriving nightlife, and great opportunities to see flora and fauna, Bali is the most popular destination in Indonesia. 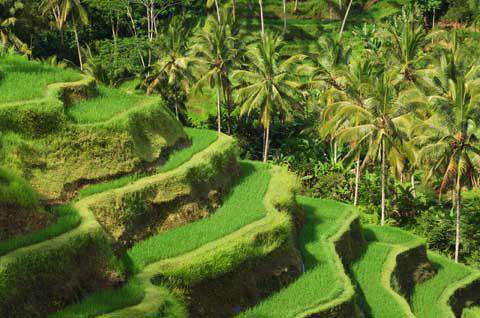 Many travelers choose to visit Bali exclusively, as it is a diverse and impressive island. Lake Toba: On Sumatra, this beautiful lake is the largest volcanic lake in the world and offers some breathtaking views. The lake is an impressive one hundred kilometers long and thirty kilometers wide and at its deepest point it is 505 meters deep. Because Indonesia is made up of so many different islands you will find great regional variation in the cuisine. Some of the common flavors used throughout the islands include peanuts, sugar, and chilies. It's easy to fall into the rut of eating fried rice with every meal as this is often the easiest and cheapest food to find, but remember to be adventurous and seek out other options because there are plenty available. Nasi Goreng: Nasi Goreng is literally translated into "fried rice." This dish is a traditional Indonesian fried rice that is common all over the country. It's made with precooked rice, sweetened soy sauce, shallots, garlic, chilies, and tamarind and often topped with eggs, chicken or prawns. There is also a slightly different version which is made with salted, dried fish, and has a subtly different flavor. Bakmi: This is a thin egg noodle dish that is boiled and served with a meat or vegetable topping. It's a wheat based noodle that is Chinese in its origin. It is most often prepared with diced chicken and soy sauce, but it is not unusual for other meats to be used. You can find this dish almost anywhere in Indonesia, in restaurants or street stalls alike. Perkedel: These deep fried potato patties are often served with meat or vegetables. They're made from mashed potatoes that are flavored with shallots, spices and garlic. They're then dipped in egg and deep fried and are often served alongside a coconut and chicken based soup. It is surprisingly easy to get to Indonesia from mainland Southeast Asia. Specifically, from Malaysia there daily ferries that depart from a variety of cities including Penang, Port Klang (just outside Kuala Lumpur), Port Dickson, Malacca, Johor Bhru, Tanjung Belungkor, and Kukup. Many people overlook adding Indonesia to their Southeast Asia trip because it seems difficult to get to, but you don't need to make this oversight. There are also ferries from a few other countries including Singapore. If you are looking for a quiet beach, well away from the more crowded options near Canggu in Bali, Pentai Seseh is the place to go. The beach is lined with dark volcanic sand and is quite a sight. Well of the beaten track, only surrounded by rice fields you often will have the beach for yourself.